Screen • 316 Wedgewire or Perf. different types of fluid sources such as sewage, reservoirs, rivers, lakes, and wells. screen. As impurities on the screen accumulate, a pressure imbalance is built up between the internal section of the fine screen (2) and its external section. When the difference in pressure reaches the preset value on the differential pressure indicator, or the duel time between flushing passed, a series of events is triggered while water continues to flow to the system units. The controller transmits a signal for a 10 second flushing cycle. 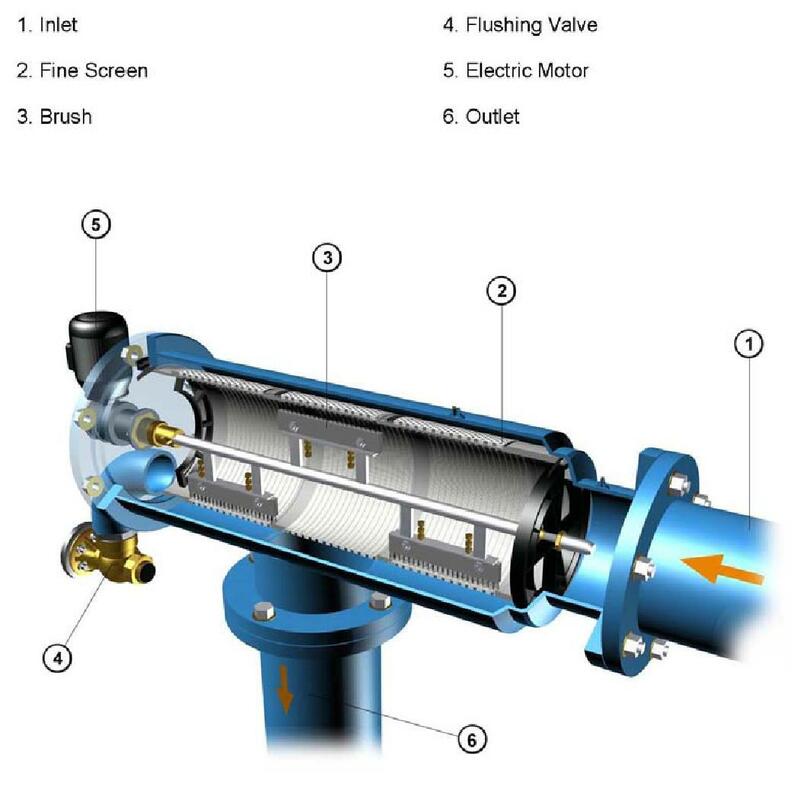 The flushing valve (4) opens, pressure is released from the inner side of the fine screen (2), the electric motor (5) simultaneously rotates the brushes (3) around its axis. The brushes wipe all of the dirt and effiicently clean the entire internal screen (3) surface. stopped. The filter is now ready for the next cycle, with clean filtered water flowing through the “Outlet” (6). The 10 second flushing cycle resumes operation whenver the difference in pressure reaches the preset pressure value set on the differential pressure indicator. If the pressure difference remains unchanged after one cycle, another cycle will start after a delay of 10 seconds.